a good life. : twenty-one weeks. bump. and then we were in the twenties. the belly starts to grow, you start to actually look pregnant & you get to feel baby a lot. i like this part. i'm comfortably pregnant. i feel pregnant & i feel little boy's constant kicks & nudges all day long. this is the fun part! well, my dwindling wardrobe isn't so fun but at least i can break out all the maternity pants & feel comfortable about the expanding waistline. and i have been. i've been living in maternity skinny jeans & yoga pants & most my t-shirts still fit. so that's good. as good as i am feeling, the fact that i have a pre-existing bad back is rearing its ugly head. i have a history of sciatic pain & uneven hips which makes me feel like an 80 year old woman even when i'm not pregnant... so the expanding hips & the increasing belly-weight puts a lot of pressure back there that i have to be careful with. i'm still able to run quite a bit at stroller strides but i definitely feel it the rest of the day. hopefully my high-intensity work out days are not numbered! i don't really feel like i have any legit "pregnancy cravings." i mean, long before i was ever pregnant i loved chocolate, ice cream & all things carbs. i just find myself giving in to those little guilty pleasures more often now that i'm pregnant. this week has been all about chocolate milk & peanut butter twix. YUM. we had an awesome weekend. despite crappy weather, we spent a lot of time outside & had some good ol fashioned family time. lots of errands, a couple meals on the town & a late night or two watching "arrested development" on apple tv. thems is the makings of a good weekend muh friends. have you tried to see a chiropractor for you hips and back? mine has been a life save this entire pregnancy. her specialty is pregnant women, and she makes you feel so comfortable. I only have six weeks left (3 till full term) and I have to say my back and hips barely hurt at all...except for the ligament pain that is. I am so excited for you! I can't wait to see pictures of your brand new little boy! you are so cute! reading about your love for chocolate milk has been making me want chocolate milk! yum! You look amazing! Can't believe you are over half way there already! you look amazing. and i love baby bumps. You are looking fabulous! I remember the back pain around that time with Will - ouch! I always love a big glass of cold chocolate milk!! 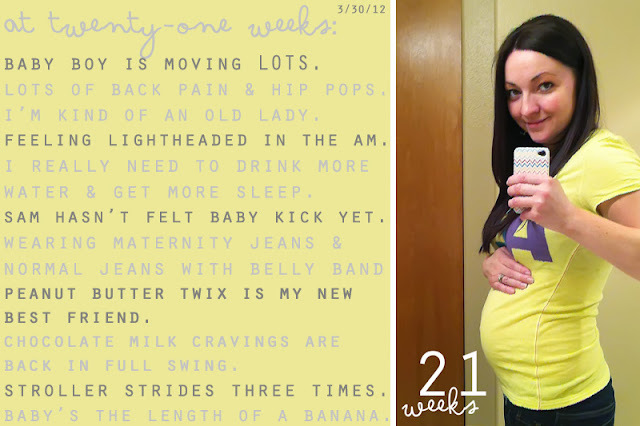 Wow, your bump is just the most adorable! And definitely look into chiropractic care if you haven't already. It does amazing things for back and hip pain. i craved chocolate milk with both of my boys! so much fun! I have missed you guys!!!! Look at that bump, it surely has grown & you look fabulous! And why did you have to mention chocolate milk? I live for it!! !